Alfred Hitchcock has been getting a lot of attention lately. He was trying to get it on with Sienna Miller in The Girl. Was shown how he got his masterpiece film Psycho made via a portrayal by Sir Anthony Hopkins in Hitchcock. And now A&E is about to unveil its Psycho prequel television series Bates Motel. I was mildly interested in Bates Motel. Anything Psycho-related or Hitchcock-related will make me perk up my ears. Not too long ago I was rewatching those Psycho sequel Anthony Perkins starred in. I guess Hitchcock trending lately got me to watch them again. Anyway, I guess I’ll give Bates Motel a chance. I’ll at least check out the first episode. All I know about it is that is supposed to take place before the events of Psycho. It’s before Norman Bates went ‘a little mad’ and his mother was able to move all by herself. So here’s the question to my fellow Psycho-fans. The original Psycho took place in 1960. So I assumed Bates Motel was going to be a period series, meaning it would be taking place the latest in the 1950’s. 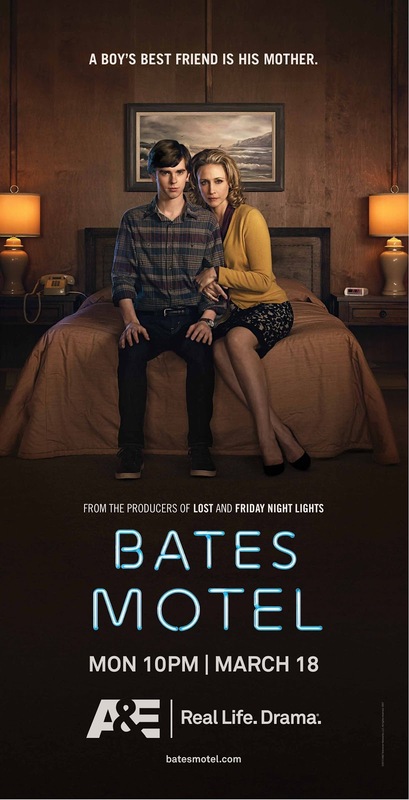 THIS BLOG POST WAS WRITTEN BEFORE I ACTUALLY READ A BIT ABOUT BATES MOTEL AND THE APPROACH IT WILL TAKE TO THE PSYCHO STORY AND THAT IT WOULD INDEED BE SET IN MODERN DAY. Makes sense right? In order to have a story about a young Norman Bates it would have to be set before 1960. I was looking at this ad for the series and noticed something I thought was strange. Psycho. Young Norman Bates. Period series. Has to be set in the 1950’s the latest. Why is there a digital alarm clock on the night table in this picture? I am by no means an expert on the history of the digital alarm clock, but this just looks out of place to see in a 1950’s motel. Especially at the Bates Motel. Just having the Bates stationary was a real luxury. A digital alarm clock would seem to be the reserved for only the high rollers who are stopping in. I don’t know what’s going on here. I’m not sure if I just picked out a faux pas by A&E’s marketing department or am I just reading too much into this. Plus, they really missed a subtle ominous Hitchcockian touch by not having the digits add up to thirteen. I’m always on the lookout for that when I see room numbers or times flashing in movies. Now maybe I’m completely off with this observation. I suppose it’s possible that digital alarm clocks were being used in the 50’s. Or could it be that the makers of Bates are forgoing keeping any kind of timeframe continuity with the original film. I will say that Freedie Highmore looks to be a much better choice to play Norman Bates than Vince Vaughn ever was. Apparently I was wrong. 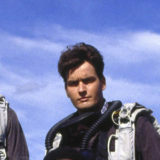 The series is not taking place in 1950’s, but in modern day. So me feeling so proud I spotted that digital alarm clock was all for nothing and now I sit here completely red-faced. This also explains why a cellphone appears in a coming attraction. Didn’t Texas Chainsaw 3D play around with the accuracy of the timeframe of its story also? I guess it’s just too hard to maintain the period detail and the makers don’t want to feel painted in a corner by it. Plus, they may also be thinking audiences today may respond more favorably to a contemporary story. Either way, I still think I may give Bates Motel a chance. What the hell IS this? They can't even make it a period show? REALLY? Anthony Perkins personally would have boycotted this since the last attempt to create a prequel-based Psycho television series because it deviated so much from the original storyline, and I say we continue his wishes and shoot this HORRIBLE idea down, I would be all for it had they done it right, but I can already tell it's going to destroy the whole original story. This is to Psycho what Smallville is to Superman. Someone who has no idea what the fans of a particular thing like about it making their own version with no reguard to the source material. They are just using the motel and characters to draw attenetion to an independant story. I don't think I can buy in. As a total Hitchcock fan, this looks like an abomination the way that the new Blue Lagoon: The Awakening was to the original story…so they are on an island for four months and the male never grows facial hair, REALLY? As Anonymous said earlier, they already tried a "Bates Motel" series in the early '90s and Perkins understandably boycotted it. Just another cash-in attempt, as every thing else seems to be these days. Oh, and I did see HITCHCOCK with Anthony Hopkins: pretty good, but far from definitive. The stuff with Ed Gein was kind of awkward , though Michael Wincott was certainly well cast…in fact, most of the cast was fine, but severely lacked what made those Hitchcock films so special. It actually bothered me that Universal Pictures had no involvement whatsoever, because the theater scenes with the invented dialogue were rather inept. By the way, you should do a Remake Recon on either PSYCHO or REAR WINDOW, that would be cool (thank god nobody has touched VERTIGO yet!). It seems like Bates Motel is not garnering much enthusiasm from Psycho fans. I'm still going to check out at least the first ep. I haven't heard any reviews about the actual show yet – I think it's a ten episode season or something. I really haven't read much about Bates Motel until I noticed that alarm clock thing which really threw me off. I'm guessing the closer to the premiere the more we'll read about it. I'm surprise no one remember they tried this before in the 80's using the same title. 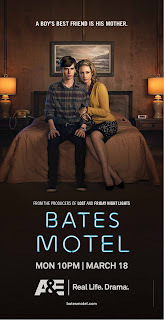 Yep, back in the 80's NBC did a Bates Motel TV show on a major network. I remember it. I saw this on a Sunday. Reason I remember it so well. It wasn't too bad, and had a really good scary movement at the end that I still can't forget. I believe there some youtube videos out there. The show failed and never show the rest of it's episode they film. There was a VHS (remember those) release, but nothing since then. It's strange cause the 80's did that mix of horror and comedy that you talk about in your Fright Night Remake Recon. This feels very much in vain of that Showtime part 4 sequel they did which told the origins of N. Bates. If you get a chance look into the 80's one. The direction was different then what they are trying now. the 3:18 is a reference to the date that the start episode will appear, 3 being the month of March, and 18 being the date. Doh! Now that makes so much sense I'm ashamed it didn't register. Thanks.